You can save hundreds of fat calories by simply baking versus frying certain foods… and the best part is that usually it tastes just as good, if not better (especially when you know it’s much better for you)! Typically, coconut shrimp dishes are fried and battered in tons of oil and excess flour and served with sugary dipping sauces. 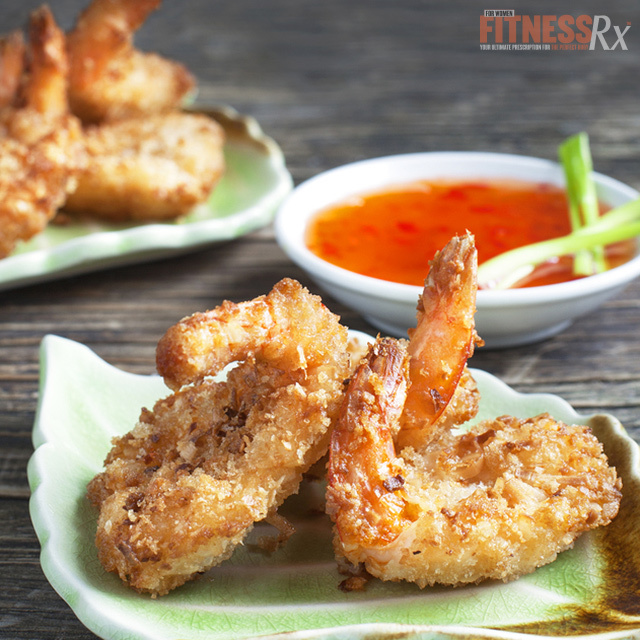 My version of coconut shrimp is baked with NO oil and no flour and served with a sugar-free dipping sauce! It has less than 10 grams of fat per serving. You owe it to yourself to give my version a try— I’m sure it will become a staple in your meals. Enjoy! 2. In a large Ziploc bag, add shredded coconut, panko crumbs, stevia, flour, salt and pepper, and shake until thoroughly combined. 3. Whisk the egg in a large mixing bowl. 4. Add the shrimp to the bowl with the egg and mix to coat the shrimp. 5. Next, add the shrimp to the Ziploc bag, seal it, and shake vigorously to fully coat the shrimp. 6. Place the shrimp in a single layer onto a baking sheet coated with non-stick cooking spray and bake in the oven for approximately 15-20 minutes, turning once when the shrimp are golden brown on top. 7. While the shrimp are baking, prepare the sauce by combining all ingredients and mixing well. Enjoy!